Monarch II LLS for Honda GL 1800 models, years 2001-Current and the new Honda F6B. 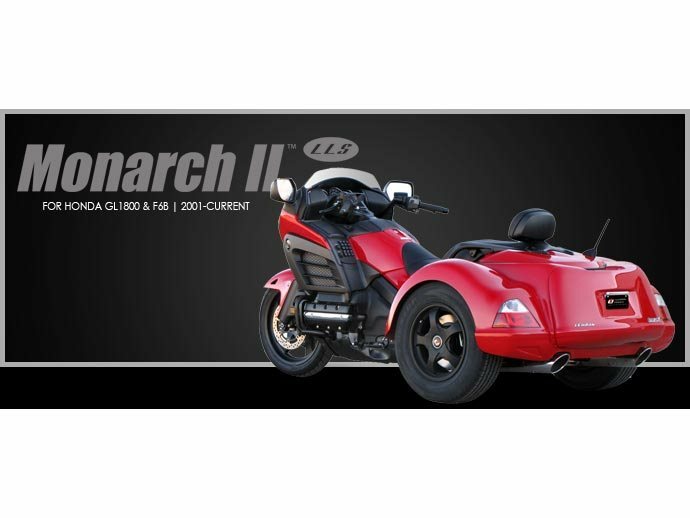 The Monarch II LLS is sure to turn heads with its sophisticated and commanding styling and you will feel comfortable and confident riding the new Lehman Trikes independent suspension. A large trunk with a vertical lift door and optional parking brake are just a few of the many features you will enjoy about your Honda trike. Lehman Trikes LLS independent suspension is designed with light-weight aluminum components for less weight added to the trike and dual coil-over shocks to provide a smooth and supple ride that your back will thank you for when you encounter those inevitable bumps on the road. The Dual H-Arm suspension provides proper geometry giving you consistent handling and precise control in corners, down the highway, or around town. The optional Adjustable Lean Control allows you to choose your desired level of cornering performance. 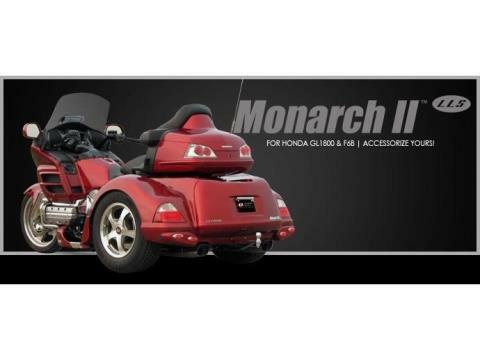 This Monarch II LLS for Honda trike body has been designed to accommodate the independent suspension while maintaining Lehman's renowned seamless styling. Made from durable fiberglass composite, the body is constructed using an open-mold fabrication process where resin and reinforcements are sprayed onto a reusable mold. The resin and glass are applied simultaneously; the spray-up is then rolled out to compact the laminate. The body is then cured, cooled, and removed from the mold. Your Monarch II LLS motorcycle trike can be painted by the Lehman Trikes factory or by your authorized Lehman Trikes dealer. At the factory, we prep the body in wet sand and dry sand. Our professional painters use state-of-the-art equipment to create an exact color match on the motorcycle trike and any accessories you have ordered to go with your trike. 2-3 coats of base and 2-3 coats of clear are applied to ensure a consistent, beautiful coverage. The Monarch II LLS for Honda motorcycle trike is then sent to polish and quality assurance to check for any imperfections. All imperfections are completely removed and reworked before moving to the conversion line. 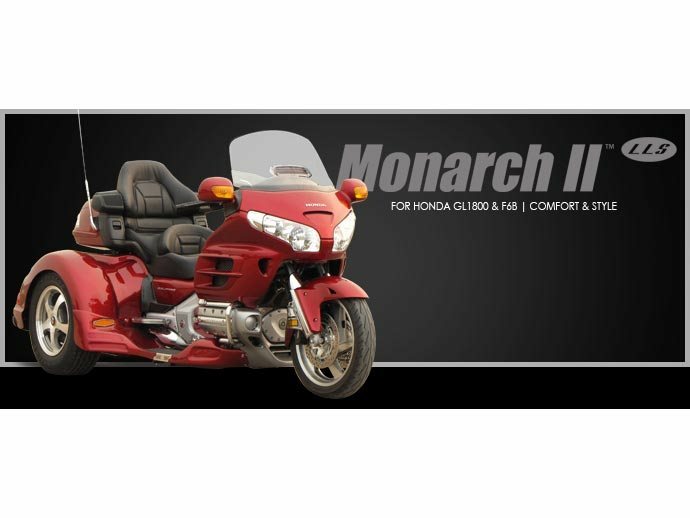 The Monarch II LLS for Honda GL1800 motorcycles also utilizes the existing reverse to assist in backing out of tight spaces. 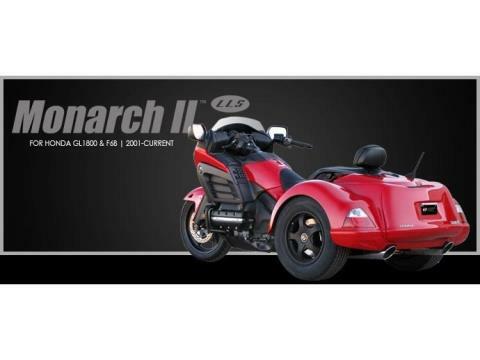 There are many optional features you can also add to your Monarch II LLS Honda motorcycle trike to further enhance your riding enjoyment including: Wing EFX Running Boards, Parking Brake, Light Bar, Hitch Kit, Wheel Upgrades, Mud Flaps, Trunk Mat & Liner, Passenger Back Rest, Trike Cover, Triple Tree, and Adjustable Lean Control. All motorcycle trike LLS bodies are quality assured during key stages of the conversion process to ensure your trike looks and performs at a superior level. Our quality assurance team works independently from all other departments and inspects each conversion and test drives all trikes before they leave our facility.